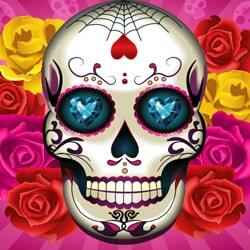 Beautiful Bones slot game review: 18 free spins bonus and 5x Multiplayer! Beautiful Bones coming out in June 2017 and get to experience the famous and cultural Spanish holiday, Dia de los Muertos. The 5×3 reels slot is filled with elegance and beauty, and takes you through the colourful cultural holiday at the tip of your fingers. Play this new amazing slot Beautiful Bones in Microgaming Casinos and you could be the lucky winner of 15,000 coins! When you land the Scatter symbols which appear as the traditional Dia de los Muertos skull, you can either play your Free Spins, or collect the skulls on a meter to trigger the Free Spins feature that will give you 3 options of Free Spins to choose from. The Wild symbol appears in a symbol of a heart, it only appears on reel 2, 3 and 4 in the base game and it will substitute all of the symbols except the Scatter symbols. These amazing symbols will be stacked during the Free Spins feature across all of the reels and will complete wins during the Free Spins symbol which will be multiplied by 4x the initial bet. To top this great feature off, the Free Spins wins will be already doubled. When you land 3 symbols that are the same in a horizontal or vertical pattern, you will be awarded with one spin again. This will also turn the centre symbol into a Wild symbol that will stay in place for your 1 Free Spin. When you land Scatter symbols during the base game, they will accumulate token on the meter which will allow you to choose between 3 Free Spin features depending on the Scatters collected. These helpful Scatter symbols will also pay in any position that they land.